Each year, the world’s largest event for the medical sector, MEDICA, running in parallel with Compamed, attracts leading academic researchers, policy makers, medical technology vendors alongside tens of thousands of domestic and international experts and decision makers from the healthcare sector to discuss the latest innovations for outpatient and clinical care. The professional "MEDICA Forums and Conferences" have become an integral part of the event, and Wibu-Systems has chosen to bring together a group of specialists on November 15th from 11am to 2 pm to share the state of the union in relation to Security for Medical Devices. 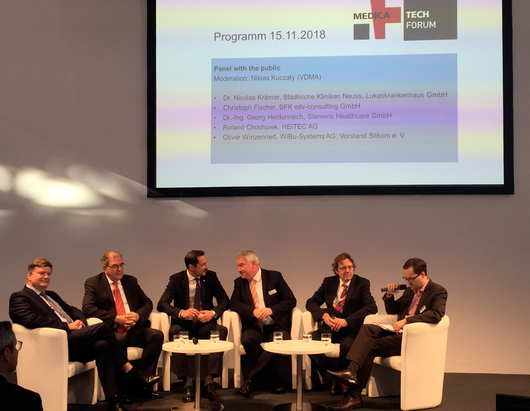 Moderated by Niklas Kuczaty from VDMA, Dr. Nicolas Kraemer from the Municipal Clinic Neuss - Lukaskrankenhaus will elaborate on the dangers of our digital age coming from unknown sources, Christoph Fischer from BFK edv-consulting will address the threats coming from cyberattacks, Georg Heidenreich from Siemens Healthineers will talk about the challenges posed by modern connected medical devices, Roland Chochoiek of Heitec will focus on new regulatory requirements in manufacturing, and Oliver Winzenried from Wibu-Systems will cast some light on the relation between IP protection, cybersecurity and monetization applied to the healthcare business. regulates data ownership and protects the intellectual property of device makers and software publishers. For instance, Sirona, the German dental powerhouse, uses the complete potential of CodeMeter: their software is protected against piracy and reverse engineering with the ultimate in encryption technologies, while each patient receives a customized milled filling designed on the spot in a single session at the dentist’s office.